And now back to the primary theme, “the fabulous F4 Phantom aircraft,” that was first flown on May 27, 1954. It was the workhorse in the air war over North Vietnam, and saved thousands of American GIs, in its ground support mission in South Vietnam. McDonnell-Douglas built 5057 F-4 Phantoms and in Japan, Mitsubishi built 138 F-4 Phantoms. 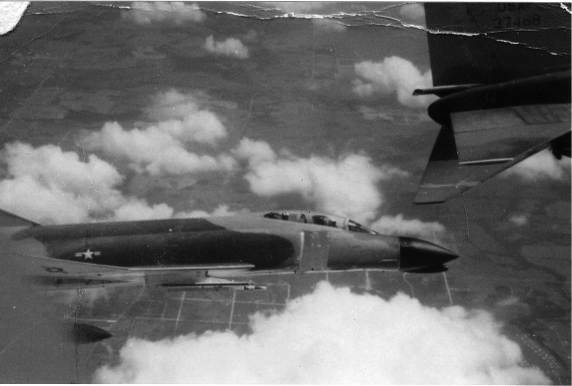 Approximately 275 F-4 Phantoms were lost in the Southeast Asian conflict. In 1966 and 1967 McDonnell-Douglas was producing 63 Phantoms per month. Even as late as 1991 the F-4 Phantom was used by US military forces in the Desert Storm invasion of Iraq. Currently there are eight nations that are still using the F-4 Phantom as a military tool. At one time nearly every country in Europe and the Middle East and Southeast Asia had F-4 Phantoms in their aviation inventory. Additionally there are nearly 100 F-4 Phantoms in aviation museums in the U. S. A lengthy litany of this aircraft’s accomplishments, along with its speed and altitude records, places it very clearly as the greatest fighter jet ever built. The cover of my book The Rogue Aviator has a picture of an F-4 Phantom. During book events and presentations, and particularly at air shows, nearly everyone immediately identifies the F-4 Phantom. Off all the good fortune that has been bestowed upon myself, flying this amazing aircraft rates at the very top. Two years ago at the Oshkosh air show, as I was signing books at Author’s Corner when I heard the loud high-pitched squeal of J-79 engines that powered the F4 Phantom. It immediately got my juices flowing, and I soon discovered there was an F-4 Phantom at Oshkosh. Unfortunately, it was grounded for the duration of the show with a freak mechanical problem. The rookie GIB (guy-in-the-back) was told by the Aircraft Commander to close the canopy. Murphy’s Law intervened and the GIB pulled the canopy jettison lever rather than the canopy close lever. A bit of a follow-up to this story is that I discovered that it is possible for a civilian to get a back-seat ride in the F-4 Phantom. A group called the Collings Foundation, operates an F-4 Phantom that is located in Houston, Texas at Ellington Air Force Base. For information regarding a back seat F-4 Phantom ride. You can call the Collings Foundation at 978-562-9182. It will require a large bite out of the platinum American Express card. In lieu of that, you can read, The Rogue Aviator and watch F-4 You Tube videos. Be sure to fasten your seatbelt, cinch down your shoulder harness and keep your air speed up in the turns. This blog is prepared by Ace Abbott, author of The Rogue Aviator, (www.therogueaviator.com).